As Canada’ s first FreeThinker Friendly Certified congregation, we are pleased to provide a series of interesting books, that, coupled with interesting people, makes for great learning and high quality evening discussion. The books for this year, focus on discovering our FreeThinker roots both within and outside of Unitarian tradition. Each of these books can be previewed: follow the links below to retrieve the introductions and selected experts of the books. Of course, these titles wouldn’t have be chosen for this series, if the whole book wasn’t good as well, – Thus there are links below for purchase (paper or Kindle) as well. The Free Thinker Book club welcomes all people, of any faith, who are interesting in discussing the forms and functions of the religious and the nonreligious in our lives and in our larger society. You do not need to be an atheist, agnostic or anything else to enjoy this community conversation. We hope you get a chance to read the monthly selection, and even if you don’t – you are welcome at the FreeThinker Friendly Book Club! Unitarian Universalist Humanists present their faith perspectives in 23 engaging and thought-provoking essays. They explore Humanist history, beliefs, approach to life, social justice, community, and religious education. Good Without God: What a Billion Nonreligious People Do Believe. A provocative and positive response to Christopher Hitchens, Sam Harris, Richard Dawkins, and other New Atheists, Good Without God makes a bold claim for what nonbelievers do share and believe. Author Greg Epstein, the Humanist chaplain at Harvard, offers a world view for nonbelievers that dispenses with the hostility and intolerance of religion prevalent in national bestsellers like God is Not Great and The God Delusion. Epstein’s Good Without God provides a constructive, challenging response to these manifestos by getting to the heart of Humanism and its positive belief in tolerance, community, morality, and good without having to rely on the guidance of a higher being. At a time when the separation of church and state is under attack as never before, Freethinkers offers a powerful defense of the secularist heritage that gave Americans the first government in the world founded not on the authority of religion but on the bedrock of human reason. In impassioned, elegant prose, celebrated author Susan Jacoby traces more than two hundred years of secularist activism, beginning with the fierce debate over the omission of God from the Constitution. 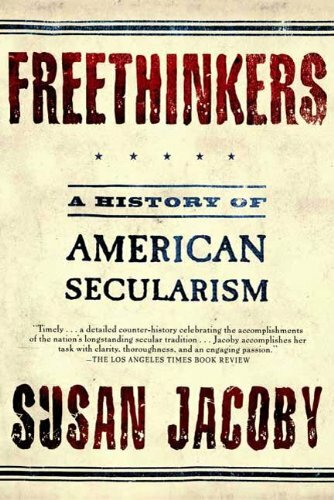 Moving from nineteenth-century abolitionism and suffragism through the twentieth century’s civil liberties, civil rights, and feminist movements, Freethinkers illuminates the neglected achievements of secularists who, allied with tolerant believers, have led the battle for reform in the past and today. Rich with such iconic figures as Thomas Jefferson, Abraham Lincoln, Thomas Paine, and the once-famous Robert Green Ingersoll, Freethinkers restores to history the passionate humanists who struggled against those who would undermine the combination of secular government and religious liberty that is the glory of the American system. This month the Book Club goes multi-media- or at least to audio. We will listen to and then discuss a podcast of a 2017 CBC Tapestry program that focuses on a number of families experiences helping their children become religiously literate while they remain secular in their own beliefs. To raise your kids with religion or not, that is the question. Guest host Ali Hassan speaks to parents who make the case for and against passing on a spiritual tradition… and a mother who’s inventing a spiritual framework for her boys. In much of the Muslim world, religion is the central foundation upon which family, community, morality, and identity are built. The inextricable embedment of religion in Muslim culture has forced a new generation of non-believing Muslims to face the heavy costs of abandoning their parents’ religion: disowned by their families, marginalized from their communities, imprisoned, or even sentenced to death by their governments. Struggling to reconcile the Muslim society he was living in as a scientist and physician and the religion he was being raised in, Ali A. Rizvi eventually loses his faith. Discovering that he is not alone, he moves to North America and promises to use his new freedom of speech to represent the voices that are usually quashed before reaching the mainstream media—the Atheist Muslim. In The Atheist Muslim, we follow Rizvi as he finds himself caught between two narrative voices he cannot relate to: extreme Islam and anti-Muslim bigotry in a post-9/11 world. The Atheist Muslim recounts the journey that allows Rizvi to criticize Islam—as one should be able to criticize any set of ideas—without demonizing his entire people. Emotionally and intellectually compelling, his personal story outlines the challenges of modern Islam and the factors that could help lead it toward a substantive, progressive reformation.